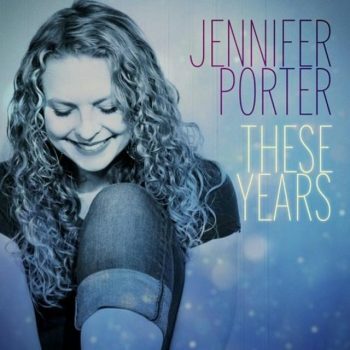 Jennifer Porter is an award-winning musician, actor and screenwriter. Jennifer has sung with Classical and Jazz Orchestras including the world famous Glenn Miller Orchestra. She is also an accomplished Blues pianist who has played with C.J. Chenier, Nathan and The Zydeco Cha-Chas and Ils Sont Partis. Jennifer was the first vocalist in Maine inducted into the prestigious musical honor society, Pi Kappa Lambda, which recognizes excellence in both musical performance and academics. Her album Easy Living (2014), with Grammy-Winning producer, Lawrence Manchester, was nominated for a 2015 Independent Music Award in the Jazz With Vocals category, and was heard on jazz stations around the country, including KJAZZ in Los Angeles, WWOZ in New Orleans, and Public Radio International’s Jazz. Jennifer has recorded 7 albums and will be releasing her newest album, “These Years,” recorded with Legendary producer Jay Newland, on December 7th. “These Years” consists of five original songs by Jennifer and five covers of songs by The Rolling Stones, Tom Waits, Bob Dylan, Van Morrison, and Bobby Sharp. Her five original songs are a remarkable contribution to the Roots/ R & B stage and include: Road to Redemption, These Years, My Secret Desire, Skin and Bone, and For You. “These Years” is a gorgeous song that opens up like a fine bottle of wine with a smooth and tasteful melodic guitar solo that Jennifer hums above. Jennifer enters singing with an angelic tone that is mellow and inviting. When she summits her alto range, the depth inside her soul resonates with a heart-warming timbre. As the song moves forward, she gently moves the listener’s emotions causing the most discerning music lover’s ears to wake up from the slumber of cookie cutter songs and enter her world of substance. “These eyes are beloved. I adore this face I see. All the lines marks acts of kindness and years of worry spent on me.” “These Years” is about gratitude and redemption. A sax solo by Andy Snitzer picks up on the melodic content beautifully adding to the sultry flavor of the song. “My Secret Desire” could be a jazz standard. It is an enormous compliment to any writer to hear that others will want to cover their work and “My Secret Desire” sounds like it is already a classic. It’s a mid-tempo song with a nice swing. “I want to play the fool. I want to make you smile. I want to be the warm breeze set you a smile that billow through your heart as we make our way home.” There is a Smokey folk flavor in the mix and Charlie McCoy’s harmonica solo picks up on Jennifer’s roots sensibilities and brings it home. His playing is so articulate and expressive that one could mistake his mouth harp for a wind instrument. This is some of the best harmonica playing I have ever heard. “Skin and Bones” is a blues-rock number and Jennifer owns it. An old-school vibe is created by the masterful John Deley on keyboards. Mid-way through the song John plays a juicy keyboard solo that gets your body up and swaying. The keys are complimented by nice syncopated guitar and a walking bass line that holds it all together. A big kudos to the in-the-pocket rhythm section consisting of drummer Tony Mason and bassist Ira Coleman who glue everything together. Jennifer opens singing, “It’s criminal baby, how much it hurt to be with you.” Fans of jazz, roots, folk and blues will fall in love with Jennifer’s artistic interpretations that aim for subtle nuance. In addition to the keyboard solo, Sherrod Barnes plays a swampy guitar solo that cuts through the thick mix. Skin and Bones is about feeling out of place in your own space and questioning your choices. “For You” captures beauty from the first note to the last. Jennifer is in her element with a sultry, gorgeous ballad that you can hear the steam rise off of. There is something about her voice that is hard to put your finger on, but the word that comes to my mind is “pure.” She can pull-off a tonal softness with tremendous strength and that is a hard thing to do. Each verse starts with “For you.” My favorite verse is “For you, I’ll forgive the world. And work at being kind. Week by week, I will see it through. For you, my dear. For you.“ It’s amazing how an artist can conjure so much emotion with such precision. This is part of Jenifer’s artistry. She can get under your skin with subtle articulation. “For You” is a beautiful love song that will bring you to tears. Ultimately it is about a love strong enough to conquer the outside world and in today’s world that is powerful. Great music can take you deep into your own soul and Jennifer’s “Road to Redemption” is more than great, it is a break out hit waiting to happen. “Broken down on the road to redemption so far from home. Lost my way. Fell tto my knees. Now I’m lost on the road to redemption. Broke down on the road to redemption.“ Back-up vocals add excellent support giving the song a touch of gospel. The arrangement has such a nice, slow groove that the music feels like honey. My favorite song on the album, and one that can match any of the chosen cover songs, “Road to Redemption” is Grammy material and places Jennifer in the league of writers who reach deep within and create songs that unltimately help us define our own humanity. Get in line and get your copy of “These Years.” This is more than a collection of songs, it is a masterpiece.